Prototype: Prignitz Railroad Group (PEG) class V 270 diesel locomotive. 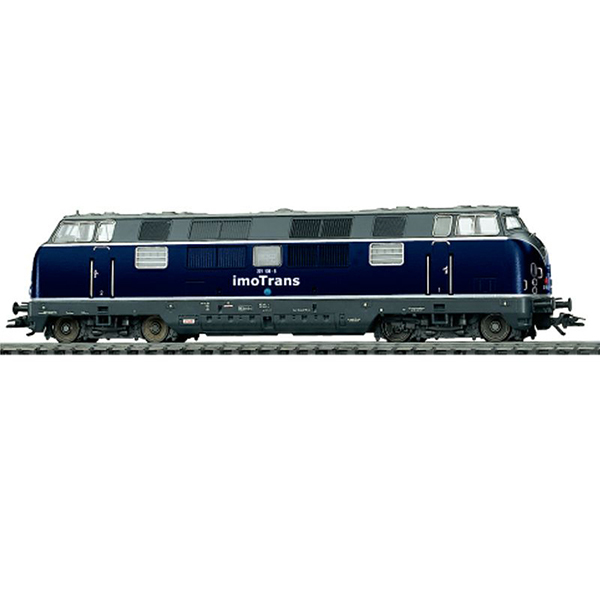 Dark blue paint scheme lettered for imoTrans. B-B wheel arrangement. Year rebuilt: 2004. Use: Freight service. Model: Era V. This locomotive comes with a digital connector, a five-pole C-90 motor, 2 axles powered, 2 traction tires. The locomotive has a die-cast metal frame and body, separately applied metal grab irons on the sides and on the ends. NEM coupler pockets. The couplers can be replaced by closed end skirting. Length over the buffers 210 mm / 8-1/4. The Prignitz Railroad (PEG) made it possible: 20 class V 200.1 locomotives came back to Germany. They are gradually being overhauled.